I am back from a great 2015 CRCRC. I had all four TQ’s, took two wins and two 2nd place finishes. Getting 2015 started out in a good direction. Here are my setups from the weekend. I don;t see on the RT6 and SC6 setups where you used the new holes but I assumed you did. Correct? No i didnt use a drilled hole, i used the standard inside hole. The drilled hole didnt seem as good. for me it gives my car a more consistent feel and better rear traction. Thanks for posting these so quickly! I don’t think I’ve ever seen a pro driver do something like this so fast. Awesome! Anyway we can see how the rb6 chassis looks without the battery installed. Can’t figure out how u got the battery strap installed without dremeling the chassis. How do you feel about running the battery sideways in the RB6? Do you think you’ll stick with it or will it depend on track conditions? Good work on your results! With your ZX6 & RB6 setups, is the surface high bite? Are you running a particularly reduced grip setup? Hey jared fastlane raceway is my local track and was looking at ur 2014 jc invitational set up. How could I apply that to rear motor?? Or do u have any suggestions. Will u be back up at fastlane soon?! To be honest, i havent driven a rear motor car in 2 years. I dont really have any suggestions, sorry. I wont be up to fastlane untill the JAM race. Hey no problem I appreciate the response. I bought my car used and it didn’t come with the mid motor parts. So I’m in the process of making a list and getting all the parts needed for mid motor. But cool see ya at the jam race! On the SC6 front shock length, you have 27mm with 2mm internal limiter. That requires the shock end to be unscrewed 2mm. I am hesitant that it will pull the shock shaft out of the shock end. I built it with no internal limiter and screwed the shock end all the way on and it measures 27mm. Any thoughts. Thanks for the quick posting of setups, much appreciated. Yes I use the limiter and unscrew the end to gain more up travel. Yopu will run into issues if you start to unscrew around 4mm, 2mm is fine in my opinion. Hi Jared. 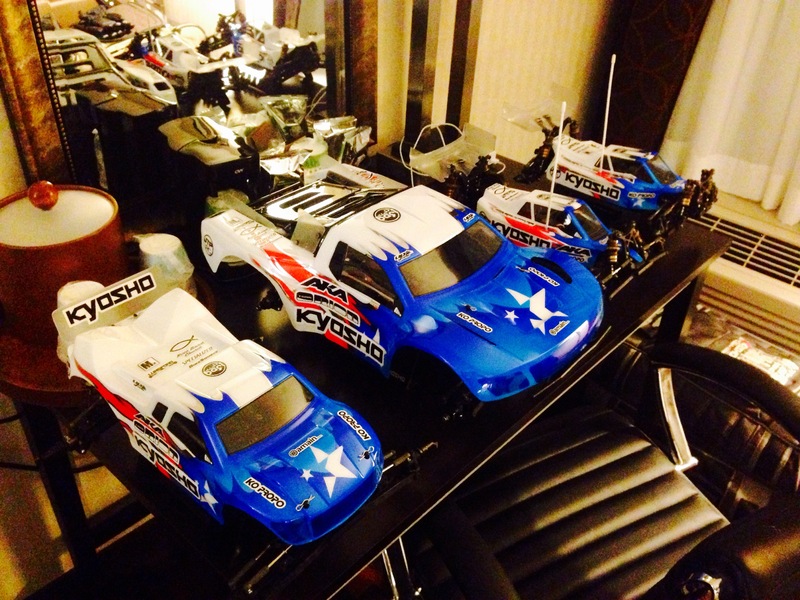 I’m sending some drop down brackets for you to Derek at Kyosho. They’re what Zack ran at CRCRC. They’re pretty legit and you don’t have to drill anymore. I am not running the flat arm anymore. It says on the setup sheet that im using the 713 arm with a new hole drilled more inside. The arm is 2mm narrower than the 521 arm on the inside mounting so you can adjust the arm position. I have the arm spaced forward. Ah ok I ran I to that problem. Tried putting the 2 mm spacer back on inside hinge with flat arms and the screw holes didn’t line up. I guess I’m just confused from the picture on the set up sheet it looks like they would go on the outer hinge. But it’s actually talking about the inner hinge? Hey Jared, on the RB6 it says you are running medium with 19mm, should that say long shock end? Hey Jared did you use the standard front tower or the test tower on the rb6 at crcrc? Hey Jared any chance we can get a pic of your rb6 with the battery mounted sideways. Looking to do the same mod just not sure on how far back the battery is. Thanks.